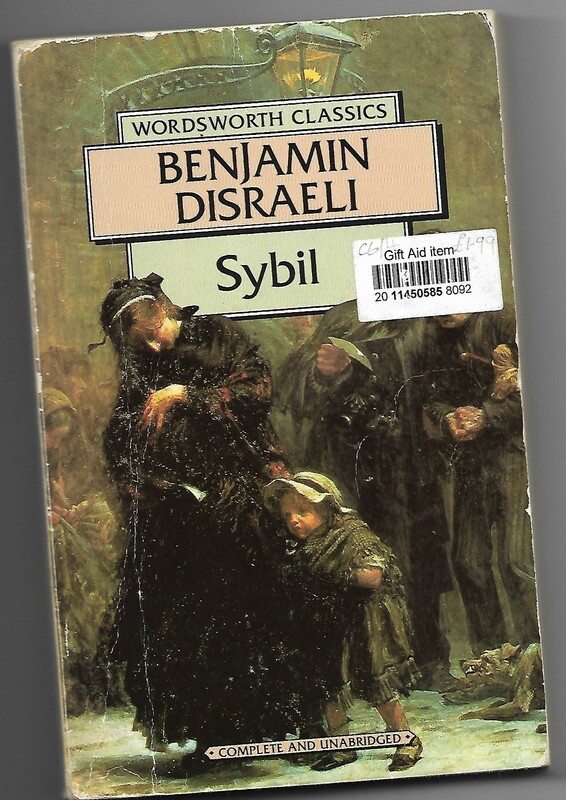 This summer, I found a copy of Sybil, sometimes referred to as Two Nations by Benjamin Disareli, who was British Prime Minister in 1868 and again from 1874–1880 in a charity shop. The book was in a far better condition then it looks in the scanned picture, it didn’t survive spending months in my bag. In the story Disraeli examines the living conditions of Britain’s working poor, a by-product of the nation’s growth during the Industrial Revolution. Disraeli, a powerful author, with his narration clear throughout the book, explores the causes of what has happened, there is a strong analysis of the political career of the Duke of Wellington and the role of the Church. Gerard if of course of a chartist reformer and Disraeli’s interest in the movement is clear throughout. He was fairly unique amongst Tories in his personal sympathy for the working class movement which would eventually have five of its six points implemented — Universal suffrage for men, a secret ballot at elections, removal of requirements to own property for election, MP salaries to allow ordinary people to run and equal electoral districts to remove rotten boroughs. The only point it failed in was annual elections to parliament. The book identifies and attempts to deal with these problems. When the characters visit the Trafford factory, it’s a vision of how industry could be better for the workers whom propel it. Sybil is considered by some to be the greatest condition of England novel of the Victorian era. Yet, it only sold 3,000 copies when published in 1845. Unlike his contemporary, Charles Dickens, Disraeli, a favourite of Queen Victoria, did not serialise the publication. Which is a shame, because the novel, or at least the ideas contain with it are an important foundation of One Nation Conservative thinking, that has creeped into the political thought of all major parties across the nation over the years. At the end of the book, Devilsdust, a rebellion leader from Lancashire is rewarded with a position that “turns a socialist into a capitalist”. Published in the same year as Engel’s The Condition of the Working Class in England, the book is clearly the work of a man who is knowledgeable and passionate about the subject, perhaps somewhat idealist, Disraeli was never able to fully succeed in his aims during his political career. Whilst, a lot has been written on the division in British society in the last year or so, this book hasn’t survived the test of time as well as it might have. It took four months for me to read the 360 or so pages, its colloquial and contemporary Victorian speech making it hard to read, but for someone who is interested in the history of British political thought, it is a welcome addition to your library. Next text to review: La casa de Bernarda Alba by Federico Garcia Lorca: A new version by Rona Munro. This is a play translated from Spanish.